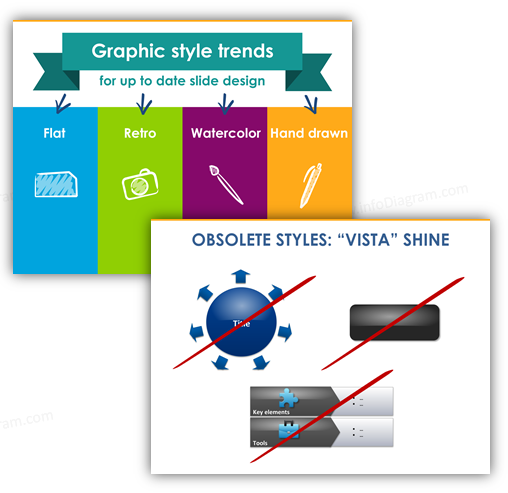 We see those major trends in business presentations – omnipresent flat style – safe bet for a neutral look, hipster retro style, personal hand drawn style and unique watercolor graphics. How you can use this information for your presentations? Flat became very popular especially when Microsoft introduced the new Windows 8 style. Today flat design (icons, infographics, web and UI design) is already the mainstream style. You can see it everywhere – in new IOS7 icons, in Windows 10 design, on web pages and even car computers. The flat style is based on lack of gradients, using a simple plain filling of shapes along with strong typography. See examples in our industry icons package. Retro style with old-looking backgrounds, lots of hand-drawn decorations and script fonts. Old style photographs are often used – yellowed or overexposed pictures. This style fits new hipsters look you can notice in various advertisements – sure you’ve seen a bunch of men with beard promoting various products. We see a Watercolor as a new emerging trend. It’s not yet as popular as flat or retro. Hence it’s a great style to use if you want to be different than other mainstream presentations. Watercolor elements are great for illustrating creativity, breaking the monotonous look of corporate slides (if you dare, or if you can). Check some watercolor slide illustrations here. This is our beloved style that can be used in a quite wide area of presentation contexts. You can create whole presentations using it (assuming your slides are not too overcrowded) and your slides will stand out from the rest. The result of hand drawn style is a nice organic personal look of the presentation. It can work as a standalone style or as subtle adding to flat style as well. See some examples of hand made shapes or banners. Non-trendy graphical styles. Avoid these! And the styles that are not trendy anymore? Definitely, Vista shines shapes and buttons and strong gradients. They are associated with already obsolete systems Windows XP and Vista or IOS6. However, those styles are still present in many business presentations. I understand that this is mainly due to a momentum that companies. It’s not easy to change the style of a big company. Additionally, gradients are one of the main default styles in PowerPoint 2007 (default charts or SmartArt styles). Anyway, it’s good to know to go away from these if you are designing new slide decks. The trends are based on presentations we see on Slideshare (a great resource for business presentation examples, by the way. Get an account there if you don’t have it yet.) and other places as well. Just look around – at modern web design, infographics or commercial ads. What’s your experience? Which style do you use and which you prefer?